With TheTimes.co.uk and SundayTimes.co.uk still not releasing traffic figures through the Audit Bureau of Circulations, we can’t yet see the impact of the paywall in terms of browser figures. But according to research published by Enders Analysis, the value of a paywall subscriber is only a fraction of a print reader. The research, carried out by Benedict Evans, compared annual incomes from subscribers for paywalled newspapers TheTimes.co.uk and WSJ.com with those for UK quality daily papers. A newspaper paywall subscriber is worth only a quarter to a third of a print buyer: even if every single print buyer is successfully converted to the paywall, newspapers will still face a basic problem of scale. Paywalls will not be able to compensate for lower revenue per reader by expanding the audience for paid news, due to the long term decline of circulation, free online news, 24-hour broadcast news and free-sheets. Future change will be radical: publishers may need to consider producing a newspaper its loyal readers recognise and value with just 200 rather than 500 journalists. This entry was posted in Advertising, Business, Online Journalism and tagged Enders Analysis, paywalls, revenues, subscribers, The Times, WSJ.com on September 3, 2010 by Rachel Bartlett. Former WSJ.com managing editor Bill Grueskin looks at ‘link journalism’ venture Publish2 and the recently launched Journalism Online, whose founders include an ex-WSJ publisher and the founder of American Lawyer. Can Journalism Online’s founder translate their wealth of ‘traditional media’ experience online? “One new firm seeks to generate much-needed revenue by building a platform for subscription services, another seeks to generate new forms of journalism with a platform to share and distribute content. It’s hard to reconcile those two visions of journalism’s future,” writes Grueskin. This entry was posted in Editors' pick, Online Journalism and tagged bill grueskin, Journalism Online, lawyer, Managing Editor, Publish2, subscription services, WSJ.com on April 30, 2009 by Laura Oliver. An illustrative feature on why local television stations in the US face a fuzzy future. “Now, with their viewership in decline and ad revenue on a downward spiral, many local TV stations face the prospect of being cut out of the picture,” WSJ comments. This entry was posted in Broadcasting, Editors' pick and tagged advertising slump, tv stations, United States, us, WSJ.com on February 11, 2009 by Judith Townend. According to industry estimates of data that the Audit Bureau of Circulations is releasing today, most of the large US newspapers saw a drop in print circulation in the six months through to September. This entry was posted in Editors' pick and tagged Audit Bureau of Circulations, Major US newspaper circulations, United States, WSJ.com on October 27, 2008 by Judith Townend. So Boris might give out Blackberries (well, ‘blackberry-type gizmos’) to Olympics spectators in 2012, but over in the States Wall Street Journal journalists are finding that their technology allowance is being cut back. That’s what the alleged internal memo reads. Comments below the Gawker article are sceptical: surely the typos in the memo are a bigger story than the computer cuts, writes ‘drunkexpatworker’. Hmmm. Authentic or not? It seems an odd kind of prank if not: it wasn’t that funny. This entry was posted in Online Journalism and tagged blogs, editor, Gawker, office-based editor, Olympics, reporter, technology allowance, the States Wall Street Journal, Wall Street Journal, WSJ, WSJ.com on October 8, 2008 by Judith Townend. Yesterday, Beet TV flagged up that a record number of users seeking online media information led to a seven per cent spike in traffic for Akamai, the delivery network which carries the internet flow for NBC, the BBC, Reuters and other news sites. The current economic turmoil, hurricanes and the presidential campaign has helped boost the need for online information. At their peak, Akamai were registering 3.7 million requests per minute. The spike follows a trend for online news sites doing well in times of financial strife: last month site traffic ‘exploded’ at the FT.com, as a result of the drop in share prices. 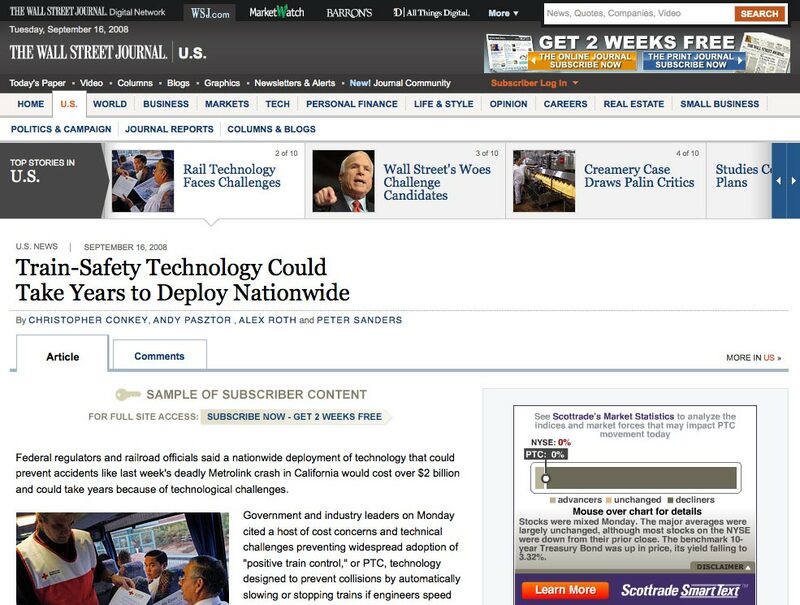 The need for information was felt on Wall Street, coinciding with a redesign of the Wall Street Journal Online. “Monday set an all time record of two million visitors”, a Wall Street Journal spokeswoman told Beet.TV. Traffic on Tuesday was nearly as high. “These are pretty big numbers, considering monthly unique visitors are 17 million,” she said. The irony is that financial disaster, hurricanes and presidential elections seem to be a good thing for the world of online media. This entry was posted in Online Journalism and tagged akamai, BBC, beet tv, Business, financial reports, FT.com, internet flow, NBC, online information, online media, Online media consumption, online media information, online news, reuters, spokeswoman, Wall Street Journal, WSJ.com on October 7, 2008 by Fred Friedrich. Paying subscribers to the site, which WSJ claims have risen to more than 1 million, will also have increased access to the site’s archive. This entry was posted in Uncategorized and tagged launch, personal finance, social networking feature, The Wall Street Journal, United States, USA, video player, Wall Street Journal, WSJ, WSJ.com on September 16, 2008 by Laura Oliver. The Wall Street Journal will activate a revamped version of its website tomorrow, but the existing wall that blocks non-subscribers from reading most of the site’s business news articles will remain. This entry was posted in Editors' pick and tagged launch, NYTimes.com, The Wall Street Journal, Wall Street Journal, WSJ, WSJ.com on September 15, 2008 by Laura Oliver.